Statistic data and from registers of activities significative on smaller but however permanent growth of potential of transport industry, what stands in contradiction both for decrease of order on transport market as well with opinions of transpose chambers that occurs phenomenon of mass firms falls. This conclusion, with analysis, has presented recently to members from infrastructure commission minister of infrastructure, helping also by independent experts works. 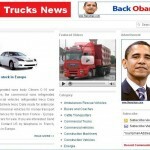 Follows from this analysis that number of trucks and corporations is growing. According to data from Office Services of International Transport, entrepreneurs had in 4th May this year 126,5 thousand vehicles with a weight exceeding 3,5t although 1st January 2008 they had 14 thousand vehicles less. Number of corporations of international car transport increase from 20 thousand in first quarter of 2008, to 24 thousand at the beginning of May this year, and from May 2004 increase by three times. he analysis indicates the presence of relatively large, compared with other countries, the fragmentation in the industry. Almost 90% of all car transport firms in Poland are those that have few or no more than 10 vehicles whilst corporations with park 50 and more vehicles is only 1%. Meantime in Western Europe is already done process of concentration of transport potential finds professor Wojciech Paprocki in the accompanying to analysis study. In 2007 year the biggest international transport companies were there 16% of all firms. Concentration permits spread standardized procedures of jobbing freights and use the same technical dissolutions. Standardization of technology on companies dispositive a big parks fosters achieve effects of production on account of better terms of fuel purchase, centralized technical services or boost drivers skills – write professor Paprocki. Dissipation of transport reflected also in other way on wore effectiveness polish transport firms. Utilizes they chiefly cars which performs Euro norm 2 and 3. Meantime exchange into new trucks may contribute to 10% savings fuel consumption what will translate into 5% reduction of costs of this Corporation, argues professor Paprocki. New cars produced in 1985 preformed Euro 2 amortize on that time average 36l km/h whereas cars preformed Euro 5 norm – average 32 l.
Those externals have go to prove that current big problems of carries with upkeep on market do not depend on implementation of several terms, postulated by environment under direction resort infrastructures, but are result of two mainly circumstances. It is about economic situation on transport market and lack of restructuring in the business of professional transport. Even the carriers ascertain that stand excess of potential of firms and vehicles. In addition come phenomenon’s deepening competition such as development own corporations transport from other industries which use unbeatable conditions for inverse transports. Last time observed phenomenon is dynamic development of country transport which use about 75% return costs of investment into vehicles purchase.